Welcome to Freezer Fridays! I've been brainstorming a lot lately; many of you seemed to really enjoy my 31 days of freezer cooking series and I'd like to continue sharing freezer friendly recipes more often.The goal is to showcase a new recipe each Friday that's perfect for making ahead and freezing. What do you think? Are you game? I hope so! My tomatoes are really starting to ripen in the garden, it's about time. The girls love going out every morning to check and see what's available for the days picking. Fresh salsa is one of our favorites to snack on in the summer. When you can grab most of the ingredients from the backyard, the store bought versions just don't compare! I hear year after year that freezing salsa is a great way to preserve some of those tomatoes and enjoy it in those cold, winter months. I figured now was as good of time as any to give that a try. Now, I like to make my batches with lots of chunky veggies rather than pureeing into a smooth consistency. Of course my batches probably won't hold up for as long in the freezer than the latter. I expect the veggies to soften quit a bit when I try to thaw out so I will make sure we use these up within a few months. Has anyone had great luck with freezing salsa rather than going the canning route? I'd love to hear your tips, please share them below! I'll plan to be back with an update on how these really turn out over time. I'm confident they'll taste great! Add all chopped ingredients into a medium sized bowl and stir together gently to combine. Taste and add additional seasonings if needed. You may enjoy salsa right away or store in the fridge. To freeze: Ladle into 2 pint sized jars until almost full, make sure to leave just a bit of room at the top. Place lids on top and seal shut. Immediately place into freezer and store until ready to enjoy. When ready to use, remove from freezer and let thaw. Serve with tortilla chips. 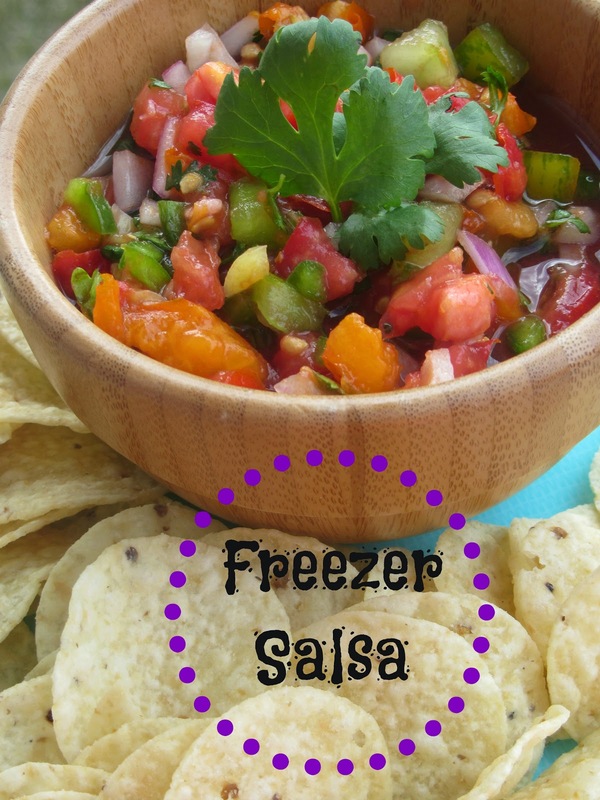 Salsa should keep in freezer for up to 3 months.